This page is a compilation of links to related Sony CLM-V55 5-inch external LCD monitor reviews, user opinions and feedback, photos, picture galleries, tips, tricks, techniques and other reference information. This Japanese-language Sony CLM-V55 review at dc.watch.impress gives a pretty good idea of what it would be like using this clip-on LCD with Sony Interchangeable Lens Digital Cameras for shooting movies. 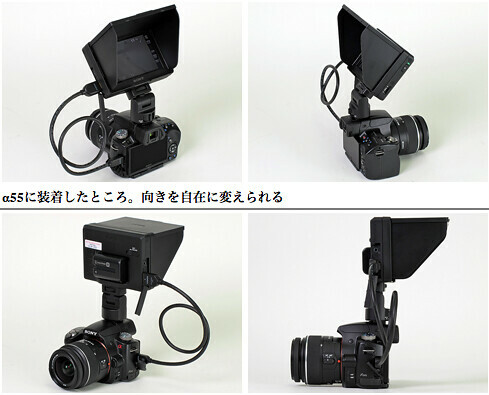 In their test, they attached the CLMV55 to a Sony A55 digital SLR camera. Learn about which batteries the CLM-V55 is compatible with.